1993 – 2013 , full 20 years, Dragomir Radojkovic-Koca have spent full time as the executive in The Serbian heritage academy of Canada running Serbian Center for Newcomers until 2000 and The Academy until 2013. 20 years were dedicated to helping Serbs in need on the voluntary basis, without any personal gain, overcoming endless obstacles in this complex endeavour. 1995 – 2013 I joined the Academy with humanitarian activities that were needed in those turbulent times of destruction of Yugoslavia and massive struggle of population in the war thorn territory. Successful fund raiser – “Save a Child Campaign” - for Hepatitis B vaccine resulted in saving over 1200 lives of children, that was achieved in only 3 years of campaigning, negotiating, supplying and procuring in orderly manner, over 3600 units of the vaccine in almost impossible circumstances during the international sanctions. (see Aktivnosti 1994 and on ). Humanitarian help was needed more than ever leading to and after NATO bombing of Serbia. Numerous activities were organized to collect funds needed to help people and hospitals. Some of those activities are documented on this site, year by year. Many activities like: concerts, fashion show, book presentations, 2 Serbian Balls, many exhibitions of Serbian painters, numerous lectures, “target” badge fund raiser during the 78 days of bombing of Serbia, and many , many more are documented on this site . I am using this opportunity to sincerely thank all of my personal friends from all over the world, members and non members of the Academy who contributed their money and the time, without whom I would not be able to succeed in achieving those numerous humanitarian goals. 18 years of my life was devoted voluntarily to helping the country that I came from, feeling obligated to do something in return for all that was invested in me to become a person that I am today. 2011 is the year of great expectations, plans for the future, dreams of creating a better image of Serbs in Canada and healing the old wounds within the Serbian community created by mal wishers that characterize our Balcan-style mentality. Inspite of all of that, Directors of the Academy were able to complete several good quality activities and are proud of that. You may view what has been done in the category " 2011 Aktivnosti "
General Annual Meeting happened on 23 of October 2011 and created a new Board of Directors that will run the Academy for the next period. There are new members and some old members from the previous board ( see "About Us" ) that will decide Who is Who on their next meeting when all elected get to Toronto. 30 years of the existance of the Serbian Heritage Academy of Canada is jubilee that will be organized by the New Board as soon as possible according to the available terms of the premissess that will be used for this project. Looking forward to the more prosperous 2012 and full of new activities, that we hope many of you will take part of. Existing for so many years, we try to fulfill as many goals and objectives of this organization, sometimes with more and somethimes with less success. “Break up and conquer” is very old moto that the west successfully used on our nation continuing the pressure until we fall apart within us, fighting for the power in politics, economy and the culture. From one political party many are created to fight against each other, church is devastated by division within itself, Serbian National Ligue is broken down into 2 organizations by the same name, cultural organizations , like Oplenac, have 2 of the same named organizations, and with this model in mind there is a tendency by some members of the Serbian community, to create 2 Serbian heritage academies of Canada. Not to mention that it is not a novelty to us, as for almost a 1000 years we celebrate 2 birthdays of the Jesus Christ !? Board of Directors is trying to realize the projects within the goals of the SHA that Serbs are proposing, but somehow volunteers are scarce. Board of Directors of any corporation is not an executor of the ideas. It should give a logistical support to any members of the organization that brought the projects forward and are willing to work on it and see it through. Until we get volunteers within the Serbian comunity to realize their, by the Board approved ideas, we are achieving ocassional help to the new immigrants and from your scarce donations we are helping children of Serbia that are abandoned by the local government in Serbia. It is sad but it is the reality. Preserving the lives comes before the cultural exchange and entertainment. Board members have spent endless hours and effort in the last 17 years trying to be acive where ever there was a need, saving the lives of children, arranging fund raising events and protecting the image of Serbia which was unfortunately tainted by many unjust actions of the west. If the times were different, our work would be concentrated more towards the cultural activities,like exchange of writers, painters, musicians,... publishing, promoting student exchange and that way adhering more to the Goals and Objectives of this organization. Now when situation is somewhat settled, we wish to surround SHA with new members able and capable of reviving the original Goal and Objectives of SHA. We have received over time the offers from some Ministries, locally and from abroad, to lend us the money for our projects, but unfortunately money is not the main ingredient of the successfull ethnic projects. We need more of the good will and the emotional boost of the Canadians of the Serbian origin to create cultural events and maintain the bridge with the country that we all came from. Are we going to succeed in that, in 2011, will depend on our own involvement ! Newly elected 9 members of the Board of Directors at their first meeting on June 23, 2010 have elected new President, Vice President, Secretary and the Treasurer and remaining 5 members of the Board are Directors at large. (Please view ABOUT US to see who is who ). Many new ideas are entertained and upon forming of the new committees for the various new activities, old and new members are invited to actively participate. We encourage your participation and wish to activate many, who were on the sidelines, observing passively many activities of the SHA until now. This is the Academy of your Heritage - use it and contribute in a constructive way to promote the best qualities that all of us brought from the country of our origin. Why not starting by enjoying the Vidovdan Celebration on June 25,26,27 in Niagara Falls, where Serbian heritage academy of Canada participates with 2 trips to TESLA monument on Sunday June 27 at 2 and 5pm from the property on Montrose Rd. Our new President, Ing. Mike Radan has prepared short but very informative speech about the Life and achievements of NikolaTesla. Participate and Enjoy. Since the last report of May 25, 2009 activities of the Academy were focused to helping children in Kosovo and Metohia, namely several schools in the area of Kosovska Mitrovica and several schools around Kosovska Vitina and Klokot. Due to very poor economic situations in that area school children needed help in buying basic school supplies, like the books, the notebooks, …….. and we organized and executed successful distribution of such supplies just in time of the beginning of the school year. We found the local supplier, prepaid for 210 sets of the necessary school supplies and all that was delivered to students by Milos Stojkovic from the association "Kosovski Bozur" . All this was possible because of your active involvement and donations and was fully appreciated by the students and their teachers, for which they send their gratitude to all of you that helped. We planned more of the similar humanitarian activities, but the response was poor and for the lack of donations we skipped this time delivery of the Christmas parcels for the orphan children with the hope that such event will be funded in the year to come. By the end of the year, one of the founders and the current secretary of the Academy Mr.Pavle Pavlovic, passed away and left a void in our hearts. Requiescat in pace. We plead again to the membership to pay their dues and retain their right to vote on the next General meeting which was not possible to hold in the last 6 years due to the lack of membership in the good standing. Out of nowhere, by the end of 2009, we were approached by the "life time member" of the Academy who brought a new hope for the revival of the activities for which the Academy was originally formed in 1981. After 17 years of her total absence from the activities of the Academy we accepted the offer of Ms.Sofija Skoric to campaign within the Serbian community and enlarge the membership with the intellectuals that would participate with their work and time and help those new ideas see the light of the day. Membership campaign was somewhat successful but the motives of Ms. Skoric surfaced, to our amazement, on May 10, 2010 when she and several friends of hers announced an illegal special meeting with the purpose of replacing the current Board of directors with people that she chose, totally misleading the new members and acting on her own behalf. In the times of the great hardship for Serbia and Serbians in Canada, such action was uncalled for and confused new and old members who were caught in dismay with the logical reaction of not showing at such meeting. A few people that showed up at that meeting realized that Ms.Skoric is not acting in the best interest of the Academy and that her "ego trip" was the only reason for her actions hoping to become the President of the Academy, misappropriate assets of the Academy and parade in Serbia with her new "Title of the President of the Serbian heritage academy of Canada". On the next General meeting with legal notice to all members in the good standing, Ms. Skoric may have the second chance to become a member of the Board of Directors and pursue her ideas. Current Board of Directors will, in due time, call such a meeting and let the all members in a good standing decide on the new Board of Directors to guide them thru the next period of active life of this long lasting organization. Invitation for the General meeting will be sent to all members by mail. 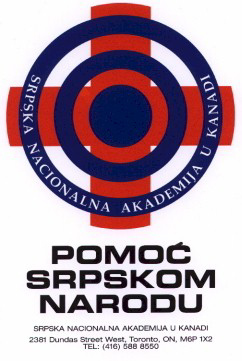 Last couple of years was spent in maintaining the active status of the Academy through the activities in humanitarian field, publishing, communication with the new Ministry for Diaspora In Belgrade, responding to various requests of the Serbian community in Ontario and providing a voluntary accounting services at the end of each year. Our traditional/yearly help to displaced children in Serbia especially in the Kosovo and Metohija region for Christmas and Easter holidays was very successful and appreciated by the recipients. Brat Milos Stojkovic from Paracin with the blessing of Otac Vasilije from Hilandar, received our donation and organized a trip for children from Kosovo to Belgrade where Princ Alexander received them at his residence and delivered Chrismas gifts. Kids were taken to various sites in Belgrade and returned home happy, knowing that there are “better days” coming soon. 25000 Easter Eggs were delivered throughout Serbia with a help of many volunteers. Full accounting with photos was sent to us as a proof of successful and greatly appreciated event. ( www.serbianheritageacademyofcanada.com ). We hope to continue those traditional activities in the years to come. We can do it, with your donations which are the essence of the successful continuation of any/all of the activities of the Academy. We reacted to the request of “Kids of Hope” ( www.kidsofhope.ca ) and offered logistics and our full service in collecting donations, processing payments to the Hospital in China and issuing tax receipts. One of 2 kids, Alex, completed his treatment with the great success and now we urge you to donate for Nicky to undergo the same treatment. Please view the site and if you find in your heart compassion, donate! Academy sponsored publishing of another book of Poems of the poet Stojanka Radenovic-Petkovic, which was presented at Serbica Books store. In these difficult economic times and fight for survival, it is not easy to find the time and the motivation to get involved in voluntary activities of the Academy. We do understand that, but hope that in the near future, some new energy, motivation and creative minds will join the Academy to achieve more of the goals that the Academy was established for. Due to the limited support of the Serbian community that we could reach, and in spite of the regular mailings, NOVINE advertising, personal contacts and SerbianCafe advertising support, many of our initiatives did not bring forecasted results. Nevertheless, with the limited donations (always the same donors) we successfully achieved our yearly Christmas, Easter and Hilandar restoration activities. Serbian Brothers help joined us with their donations and with a help of Milomir Milicevic and his friends we collected enough to complete humanitarian projects. After completion of each event we have received a written report from Serbia with the Thank you notes, photographs and CD from the Udruzenje gradjana “Kosovski Bozur” from Paracin who were in charge, under the blessing of Father Vasilije from Hilandar, and who successfully organized all those activities with our donations. Various donations in equipment and medical supplies were successfully delivered to Hospital in Gornji Milanovac with a generous help of Slobodan Ivanovic from Serbian Business Center who donated all shipping costs. Society for Multiple Sclerosis Moravickog okruga - Gornji Milanovac had a need for adult diapers and after finding a manufacturer in Novi Sad we were able to purchase a year supply of diapers for $1,860.00 for which all recipients are extremely gratefull as we improved a quality of their lives. Slobodan Cirovic from KONBEL money transfer, donated his services in transferring money to pay for the purchased supplies. From the limited funds we have donated to Tesla Memorial Fund as well as to Ruskoka Church fund who were in the past giving us a generous donations for our activities. In our publishing effort we collected $4,000 for the unique book “Starci Hilandara” that is to be published by fall of 2007. STVT was supporting our activities and announced in many occasions our activities on their TV program and for that effort we donated to their program. We also donated to The Leukemia and Lymphoma Society of Canada, to Ana Delic from Burlington,Ont. who participated in the Marathon for Health and who approached us for the sponsorship. Due to the poor health of some of the members of the Board, I have taken over all other organizational and administrative responsibilities since 2004 including but not limiting to the accounting, bill payments, processing of various requests from the general public, communication with other associations within the Serbian community, maintenance of the membership, processing all donations and payments, communication with various organizations in Serbia to whom we sent donated goods and donations, renewal of the mortgage, maintenance of the current tenancy in our building, maintenance of the premises that we occupy, issuing of tax receipts at the end of each fiscal year and all else that become necessary in the regular activities of the Serbian Heritage Academy of Canada. The newest interest of the Serbian community in the activities of the Serbian Heritage Academy of Canada has resulted in increased membership that will possibly bring some new energy and enthusiasm and broaden activities of the Academy. At the next annual general meeting, newly elected Board of Directors will continue and improve the activities of this long established organization. Donation of medical supplies by Ontario Government Pharmacy at the beginning of 2004 was sorted, repacked and offered to several hospitals in Serbia. Due to the expensive shipping charges for which we did not have sufficient funds, shipment was waiting for the shipping space in the collective shipments of Serbian Business Center containers and finally delivered in Belgrade in April 2004 with charges donated by Slobodan Ivanovic. When Monastery Hilandar burned down 50% on March the 4th 2004 a new need for donation started a new campaign and resulted in 1890 Euros ( cca $3000 ). I personally delivered that money to Hilandar in the summer of 2004. This was the first and only cash donation since the fire, in spite of many promises from individuals and institutions around the world. As this was a minute sum of money in the renovation budget, it was decided to dedicate all sum to the bread purchase in the Bakery in Uranopolis, to feed priests in Hilandar for a year. They were thrilled with our generosity and extremely thankful. In December 2004, call came from Yerevan-Armenia suggested by the local Red Cross office as a last chance to save the lives of a family of four that were at the end of energy and finances for survival. Living in outrageous conditions, all four in one small room for over 3 years, feeding themselves from the garbage bins and the worst, discovering that their 8 year old son got brain tumor. The only solution was to help them get back to Serbia-Erdevik and end their misery of 8 years of wandering . Money was sent by Western Union for their food and for the tickets Yerevan-Moscow-Belgrade. 5 days from the first call they were in Moscow waiting for their plane to Belgrade – promised to call when they settle back in Erdevik. This time we saved 4 lives. as he does each year. Koca and me went personally to get that donation and to personallt thank Mr.& Mrs. Markovich for their continuing generosity. All tax receipts for 2004 were administered for eligible donations by December the 8th. Since my May 9.2002 report, several humanitarian activities have taken place. This is only a part of all humanitarian help that was organized and processed since my last report. SHA was approached by the friends and family of Marija Filipovic-Kecman to administratively support a humanitarian effort in collecting funds for Cancer treatment that was the only hope for young mother of two. Many months of collecting resulted in sizable donation from friends and relatives. Unfortunately Marija’s treatment did not happen, she is not with us since August and collected funds were spend to cover the expense of medicine and the funeral arrangements. Easter Egg campaign for 2003 was successfully completed by Milan Jojkic with a help of Milomir Milicevic from donations collected from friends and members of Serbian Heritage Academy. Amount of 940 Euro was sent to Hilandar and 35.000 Easter Eggs were distributed by churches and monks from Hilandar throughout Serbia and Republika Srpska. Most of the Eggs were given to kids and distributed throughout Mental institutions and jails. Gratitude certificates were mailed to donors and pledge for new help was received from Father Vasilije from Hilandar. We will make an effort to collect some money and help Association of sick persons from Pomoravlje, Paracin who are in need of furniture and equipment for their new premises where the handicapped, paraplegic and mentally retarded patients have to be organized in the work groups and produce within their capabilities and that way become useful participants and improve their therapy by working. SHA administered another humanitarian apel for another young mother, Marija Maslar, also cancer patient who is fighting the decease. In August 2003 Ontario Government Pharmacy have donated 500 kg of medical supplies that were picked up by Dragomir Radojkovic-Koca and Milan Jojkic. Donation was sorted and repacked for shipping and transported by the container FREE of CHARGE – shipping cost was donation of Mr. Slobodan Ivanovic from Serbian Business Center from Toronto. Medical supplies will be delivered to Zdravstveni Dom-Vracar in Belgrade, where such supplies will be invaluable. All donations eligible for the tax receipt were administered on time and Certificates of Gratitude were sent to donors. During the last 2 years since my last report, great many activities have taken place. From “ITALPASTA” we were able to arrange for a FREE load of 1 ton of pasta , with the generous help of Mr. Bozidar Perovic and we shipped all through ADRA organization for the local distribution in Serbia. The latest request that arrived from Hilandar resulted in $1,045.00 ( 700 Euro ) collected and donated for the purchase of Easter Eggs that monks from Hilandar distributed between 30000 children in Serbia. This is only a part of all humanitarian help that was collected and processed since my last report. All donations eligible for tax receipt were administered on time and Certificates of Gratitude were sent to donors. Since my last report, many Humanitarian activities took place. US $ account and I have sent "Zahvalnica " acknowledgements and thank you notes. Promoting this campaign can bring us necessary funds and enable us to forecast and budget for the future activities. Please, spread the word between your friends. Slavko Todorovic from Montreal, through my initiative, started collecting donations for G.Toponica to purchase EEG, and successfully collected $6,000.00, hoping to collect the balance and obtain that equipment by the end of this year. donations promised by ADRA and found that large quantity of clothing and medical supplies was available to us collected by Canadian public, which was collected and transferred to Toronto and packed into the 40 foot container. 20 computer systems that were purchased by the Academy as well as 2 Macintosh systems that were donated by the Canadian government offices in Toronto through the effort of Goran Ciric , friend of Dr. Vukic , were also part of the same shipment. Srpska bratska pomoc donated also several boxes of clothing for the Psychiatric hospital and "Zahvalnica" was prepared and delivered to them . Slobodan Ivanovic from Serbian Business Centre in Toronto donated $1,300.00 to offset the shipping cost of the container ( we paid only $2,000.00 ) for which donation "Zahvalnica" was delivered to him to acknowledge his support. Container is on its way and expected to arrive to Gornja Toponica first week of September. Next donation from Sudbury Hospital, containing promised beds, bedding and medical equipment is expected to be shipped by the end of the year. ADRA representative, Ljubica Djakovic, from Toronto is preparing ADRA'S own container in September and will contribute with our organization donation in detergent and other sanitary supplies. On August 8.2000 I have visited Dr. Dragan Vukic in Nis and introduced representatives from the Ministry of Agriculture from Belgrade in order to help him develop successful production of produce in their solariums ( tomatoes, peppers, zucchini,.. ) for the Hospital use as well as for the sale to the local markets. That way Hospital would have created an income as well as therapeutic means for the patients who are well able to participate in the day-to-day agricultural activities. Hospital management is delighted with our efforts and help and are extending their gratitude to all that are involved in helping. I plan to stay involved in this humanitarian activity and need as much help as I can get from all members of the Academy. Through the effort of Koca Radojkovic we have received a sizeable donation of $4,000.00 from Mr. Andre Markovich, whose generosity is continuing after many other donations he has given for our previous humanitarian activities. As for the traditional Fall Bal 2000, deposit have been paid, date has been set for Friday November 10.2000 at the same premises as the previous years. We should be able to sell at least 400 tickets at $80.00 p.p. through the advertising to the general public and our members and earn $12,000 - $14,000 clear profit which should help as meet our expenses for a while in maintaining our premises and continuing the existence of The Serbian Centre for Newcomers. Help is needed in administering mail outs of advertising and other promotional material. Volunteers are needed for the telephone soliciting of payment of this years membership and advance sales of the tickets for the Bal. In continuation of the effort to help Centre for Traumatology – Bor , with necessary supplies for fractured bones, after several attempts, suitable manufacturer was found in Novi Sad and Pro-Forma invoice was received for emergency supply of special bone screws. Amount of 3,700DM was transferred from our Relief Fund and within days several important surgeries were scheduled. Dr. Ljubinko Todorovic – Chief of Traumatology organized media coverage to acknowledge receipt of Humanitarian Help from us and sent sincere thanks to SHA for the help received. Constant contact with Special Psychiatric Hospital in G. Toponica-Nis resulted in Dr. Dragan Vukic – Director of the hospital accepting our invitation to come to Toronto and assist in organizing humanitarian help for the Hospital. Milan Jojkic was his host for 14 days in May 2000 and within that time many hospitals were visited, several consultations with local Psychiatrist have been arranged, 9 lectures were organized in Toronto, one in Ottawa and one in Montreal. Kind donation, of Canadian Opera Company space and equipment, through our member Sandra Miletic made lectures possible at no cost . Bisa Scekic donated her service and the sound equipment for the presentations. Poor attendance did not effect enthusiasm of a new group of Serbs that decided to get involved and new Humanitarian committee was organized for the purpose of producing a Videotape and a CD suitable for promoting our humanitarian effort and disseminating awareness of the current situation in Hospital in Toponica. Several articles and interviews were published in NOVINE and general appeal was announced, but so far did not result in any donations. Videotape was produced and is available to anyone that wants to see it and use it in Fundraising effort. In cooperation with TD Bank SHA paid for the service of Automatic Bank Withdrawal to kick-start the fundraising based on ONE DOLLAR A DAY. If only 1% of Serbs living in Ontario would participate by giving us a “VOID” cheque that would allow us to debit their account for $1.00 a day ( $30.00 monthly ) this would be very successful Humanitarian Aid Campaign. I honestly believe so but as of this moment actual “VOID” cheques were received only by: 1. Milan Jojkic 2. Dragomir Koca Radojkovic 3. Maria Rossi 4. Zeravcic Zorica 5. Vojvodic Nenad and 6. Sandra Miletic. I expect to receive soon more cheques as many promised to help this way. ADRA supported our appeal by connecting us with Hospital in Sudbury which is under renovations and will donate over 100 beds, mattresses, linen and medical instruments that are being replaced but are functional and of invaluable help to Toponica. We urgently need $6,000.00 for the shipping costs Sudbury – Toponica. Dragomir Radojkovic, Slobodan Ivanovic and Milan Jojkic drove to Sudbury to make arrangements for the takeover of the hospital beds. Beside all other efforts , our traditional fall SERBIAN BAL 2000 should be at least as successful as the previous three times with little more engagement of our members of the Academy. All that have time to promote this Humanitarian Campaign will get all material and video tape from me. Thank you all that were participating in these Humanitarian activities. We should not stop now – call me after viewing the Video ! Between Oct.13-31.98 equipment has arrived to Belgrade through the assistance of the Slobodan Ivanovic from CBC and Red Cross. Customs release, permits, delivery, installation and training of the Clinic personnel done by me. Official Thank you card and endless thank you from the Hospital personnel have been sent to all of you that were involved in this humanitarian undertaking. REMERON anti depressant requested by Special Psychiatric Hospital in Gornja Toponica and Institute for Mental help in Belgrade, Palmoticeva 37.Through the importer, necessary quantity was secured and 9.500 DM was spent purchasing the drugs. 2/3 were taken to Gornja Toponica and 1/3 was personally delivered to Institute for mental health in Belgrade. PERSONALY DELIVERED Visit to Gornja Toponica was devastating experience. Deteriorated living conditions without heat, bedding, beds, chairs, sanitary facilities, 60 people per room roaming around half naked and soaked in their own excrements, disoriented and hopeless. Visit to Belgrade Institute for Mental Help was less disturbing but in need of humanitarian help as well. They have appreciated very much the drugs I brought , which they would not have had funds to purchase and were essential for their work. Mlnica za Vaskularna oboljenja mozga “Sveti Sava” Beograd. Minimal quantity was purchased for US $ 1,500 and delivered personally to the Chief Dr. Djina Ukropina Thank you all that were participating in these Humanitarian activities. advertising, promotion, collection, administration, issuance of tax receipts, coordination of sales with other cities, communication, local and long distance, sorting of humanitarian help guidelines and official information, analysis of various requests , selection of attainable tasks, and finally successful procurement. ALL ACTIVITIES ARE SELF FINANCED, all expenses were paid from the proceeds of sales and clear profit deposited in the Relief Fund account by Milan Jojkic and or Dragomir Radojkovic on regular basis. FULL ACCOUNTING for the activities is reflected in the running balance of the account which is available to anyone interested at any time. Stojanka Radenovic, administrator is recording necessary details for proper issuance of Tax Receipts. Milan Jojkic will sort the names and procure tax receipts by the end of calendar year. Many members of SHA and general public were involved in selling badges, making this activity financially successful. Target Red Cross was created to run during the demonstrations. Since the end of regular demonstration, this particular activity is winding down , to be replaced by some new ideas, activities and to be run by other members of SHA. Canadian Opera Company , through Sandra Miletic, contributed free of charge, facilities for the Concert at 227 Front St. E. Location. Attendance of approx. 250 people and excellent performance of musicians made all effort worthwhile. Many members of community helped in the realization of this event. Event was successful artistically as well as financially and clear profit of about $2,000 was deposited into Relief Fund account. Successful Fashion show , produced entirely by young and enthusiastic fashion model Mara Matejic with help of SHA, DOCKS and the Ticket Master, attracted approximately 700 people and after all expenses, resulted in $5,500 contribution to Relief Fund. 40 kg of antibiotics and anesthetics , donated by Kingmount Pharmacy from Stoney Creek, Vesna Curcic-Manager, was personally delivered to Hospital Dr.Dragisa Misovic in Belgrad and $53,000.00 collected by SHA Campaign , was personally deposited into the account of MEDIFARM D.D. in Belgrad, the official supplier of YU hospitals , which submitted their orders to Medifarm for the most needed medicine. During my 2 weeks visit, many hospitals and clinics were visited and new requests are being considered as the continuation of this Humanitarian Campaign. Tatjana Pirovic, Painter from Zemun and Branimir Minic, Painter from Belgrad, selected 15 paintings each from their popular portfolio to be sold in Toronto and all profit over the minimal price they have set , will go towards Relief Fund of SHA. Auction and or selling exhibition will be organized shortly. All documentation regarding the above activities will be available, by the end of the year. and I am personally committed to participate to the best of my ability . Upon meeting Dr. Ziva Vukovic, vaccine coordinator for UNICEF in Belgrade in October 1994, I have understood the seriousness of children mortality from Hepatitis B for which the vaccine was not available as all funds allocated for the purchase of medical supplies were blocked by the International Sanctions against Yugoslavia. Upon my return to Toronto, I have formed and registered “Save a Child Campaign” Hepatitis B Fund, established the Bank Account, discovered an appropriate supplier for the “recombinant vaccine for Hepatitis B “ Smith-Cline Beecham from Holland, obtained appropriate permits from Butros Butros Gali, at that time Chief of UN in New York responsible for the war thorn Yugoslavia, and started the Campaign through friends, business acquaintances, local Serbian media and local Serbian organizations that had a Charitable status at that time. Dragomir Radojkovic, from Serbian Heritage Academy of Canada, was the only one of many approached Charitable Organizations, understanding the complexity of this undertaking and offered patronage of this Project by SHA. Charitable status of SHA helped in colleting donations that qualified for the Tax exemption status. From 1994-1998 Hepatitis B Vaccine was bought in small batches as donations were collected and processed, delivered directly to Zavod za Zastitu Zdravlja Srbije, Beograd, Dr. Subotica 5 and distributed under the watchful eye of Dr. Ziva Vukovic. Each vaccine was accounted for, distributed officially to the hospitals under the strict supervision and record of the patients, their doctors, history of the illness, serving the purpose of obtaining the second dose and subsequently third dose to complete needed therapy. All evidence is held for the safekeeping in the Zavod za Zastitu Zdravlja Srbije. Final outcome of this campaign is that over the period of 4 years, 63 shipments were sent to Yugoslavia, 1130 children lives were saved , over 400 people and businesses donated and received tax receipts, countless hours to administer all activities were spent, many “thank-you” letters were received from many parents and the doctors. When medical sanctions were lifted in 1998, Save a Child Campaign have closed the account, successfully completing the Humanitarian task of helping children in Yugoslavia. Countless recipients of the vaccine are thankful to all involved in Canada that have helped in this campaign. Without the help of the Serbian Heritage Academy of Canada this Campaign would not be as successful.